This Coconut Vegan Panna Cotta Recipe sounds fancy, but it's a very easy recipe. Easily made sugar free & low carb too! Dissolve 1 1/2 teaspoons gelatin in 1 cup coconut milk. Let sit for 5 minutes to fully hydrate the gelatin. Heat the coconut milk and gelatin over medium heat, being careful not to let it boil. Stir continuously until the gelatin is fully dissolved, which will take around 5 minutes. Puree fruit with sweetener and stir this into the warm coconut milk until evenly combined. Remove the mixture from heat and let cool for 10 minutes. While the mixture cools, split the lemons or limes in half lengthwise with a sharp knife. Use a metal teaspoon to carefully scrape out all the pulp and segments, leaving the rind empty and intact. The pulp may be used in other recipes or drinks, like lemonade. 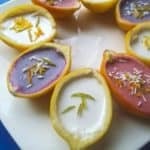 Note: If you prefer to keep things simpler, skip preparing the citrus cups and use ramekins. Pour the warm coconut milk mixture into half of the rinds (or ramekins), making sure they stay level. Reserve the other rind cups for the second batch. Chill uncovered for 30 minutes, then cover and refrigerate for 2 hours or more. Into a clean, cool saucepan, pour the other cup of coconut milk. Dissolve 1 teaspoon of gelatin as in step 1. Heat and stir coconut milk mixture as in step 2. Stir in 3 tablespoons of sweetener (or stevia to taste). Remove coconut milk mixture from heat and let cool for 10 minutes. Pour the warm mixture into the remaining empty citrus rind cups. Chill the second batch of panna cotta for 30 minutes uncovered and the cover and refrigerate for 2 hours or more. Before serving, garnish with colorful citrus zest or shredded coconut (optional).